German cooperative baumraum offers fully customizable tree houses made primarily of wood and rope, with clean, modern lines that defy the traditional assumptions about what tree houses should look like. 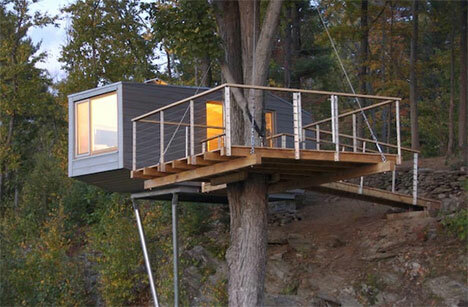 The tree houses above were commissioned by clients in Austria and New York, respectively, and were built to suit the individual sites with the intent of disturbing the surroundings as little as possible. 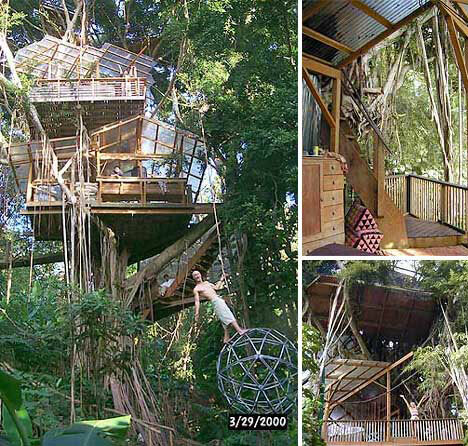 The Biosphere Tree house is situated in a great Indian banyan in the Manoa Valley of Oahu. This seven-level tree house has transparent roofs, electricity, a composting toilet, hanging bridge and stunning views of the valley and the sea beyond Waikiki. A 7-foot steel “star dome” swings above a pool in the stream at the foot of the tree. 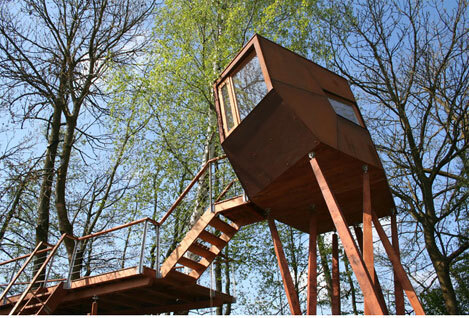 The three tree houses above were created by Blueforest, a UK-based company offering full design, consultancy and management services for tree house projects across Europe. 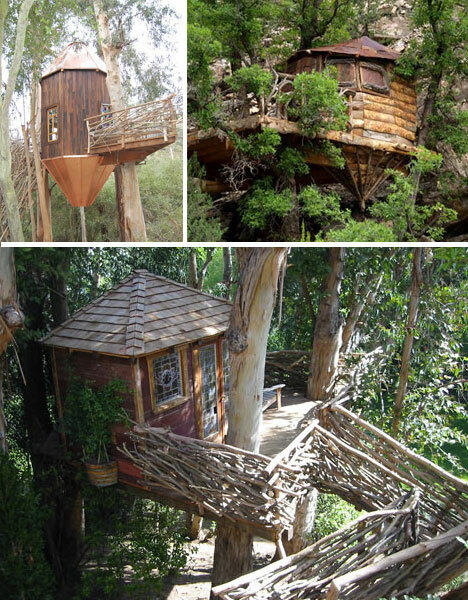 Blueforest’s adult-size tree houses start at around $15,000 and many have kitchenettes, bathrooms and full-sized living rooms. Some even include high-tech features like fingerprint locks, CCTV control centers and plasma televisions. 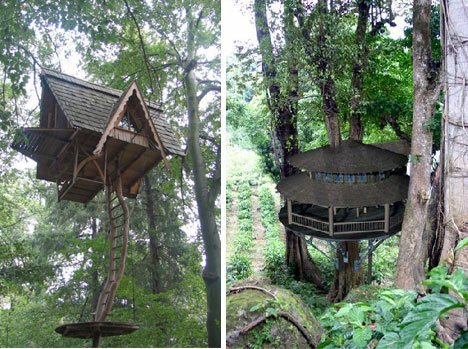 The Alnwick Garden tree house is one of the largest wooden tree houses in the world at 6,000 square feet. 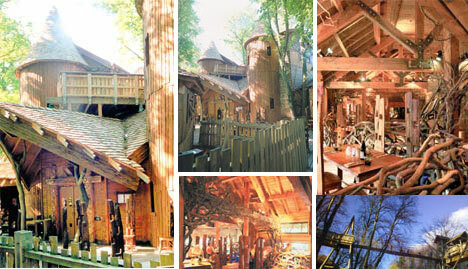 Inside is a learning center, restaurant complete with fireplace, play areas, turrets and rope bridges. The tree house was built using natural materials from sustainable resources including Canadian cedar, Scandinavian Redwood and Scots pine. The Alnwick garden is a public garden space in Northumberland, England. 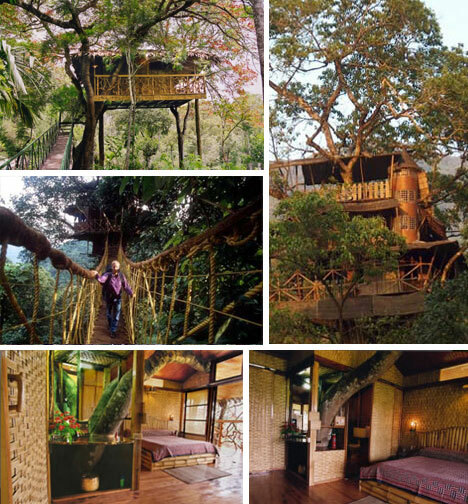 These two relaxed yet highly functional tree houses are part of the Finca Bella Vista tree house community in the rainforest of Costa Rica. The community is home to ecologically minded adventurers wishing to preserve the 300 acres of rainforest surrounding their homes. Its residents enjoy hydroelectric and solar power and wi-fi internet, and have biodigestors to process waste. Dozens of land parcels are still available for future residents to design and build their own tree houses. 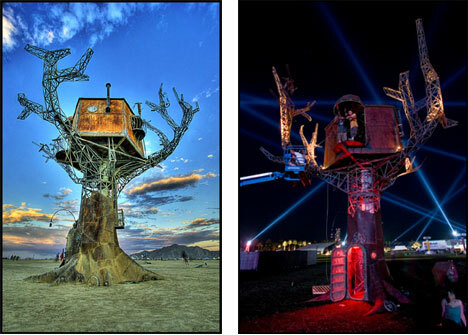 Romero Studios, helmed by Roderick and Anisa Romero, designs and creates tree houses so striking they look more like art installations than dwellings. 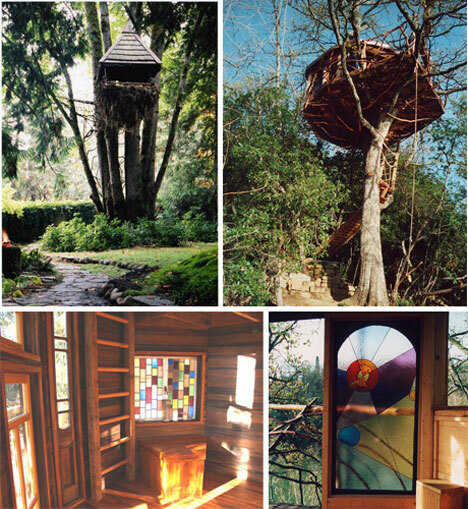 Their work includes one of the tree houses at Finca Bella Vista and the four tree houses pictured above, among many others. 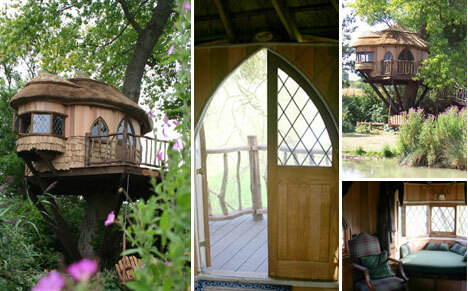 Clients have the freedom to create the tree house of their dreams, from Moroccan lantern-shapes and suspended ‘nests’ to rustic cabins in the sky. 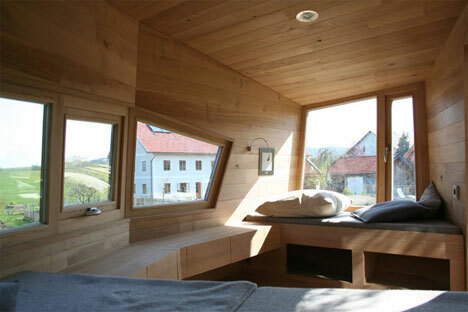 Special touches include built-in storage and stained glass windows.